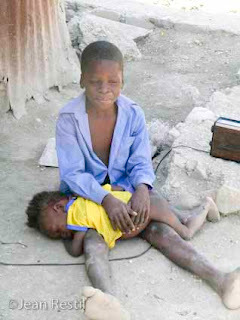 Poor Haiti, the nation they would have us believe is close to a failed state, needs our help once again. A recent AP article shook charitable institutions to their core by revealing that Haitians are eating cookies made of mud to fill their bellies. 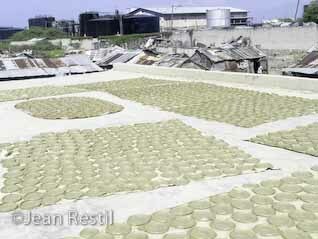 After more than an estimated 2 billion dollars of international aid to date, not including all the spiritually challenged Jesus folk who invested a lot more, Haitians still have to live off mud cookies made of dirt to survive. What a realization! Now comes the deluge of charities trying to do for the Haitian people what they presumably cannot do for themselves while never asking what happened to all that aid money. Some do it for humanity while others do it for Jesus and all the while it builds more dependency not less in Haiti. Helping Haitians for the Christians is a helpless exercise as they use the poor to reassure themselves of their own relationship to HIM. For the humanitarians it’s to stave off a sense of helplessness as children with bloated bellies and blondish hair go to bed hungry for more than food each night. Their parents need work for real wages and yet their benefactors just don’t seem to get it. I suppose knowing that Haitians are dependent on you is reassuring and adds purpose to otherwise dull lives in the first world. It certainly seems preferable to accepting that only political independence that allows resistance to Haiti’s wealthy few and forces them to share the spoils is the only answer to poverty. What a terrifying thought. And Jesus was killed for less. Haitians have always been told that the reason they go to bed hungry is their own fault. No matter how many embargoes have been imposed, since 1804 and continuing through to 2001, it remains THEIR fault. Despite all the poverty and blame they still manage to cling to an indomitable faith that tomorrow will be better for their children. Resiliency is a fundamental part of the Haitian character to be admired. Should we expect less from a proud nation of former slaves that defeated Napoleon’s armies only to be forced backward by their slave-holding neighbor to the north? Remember that when Haiti won its independence, as the world’s first black republic, the US was still a country whose development depended upon human chattel kidnapped from Africa. Haitians wear their history on their chests like many of their would-be saviors wear bleeding hearts on their sleeves. The real irony is that while Haitians suffer from the malady of having had their house turned upside down by a coup financed by foreigners in 2004, those same foreigners blame them for not being able to manage their own affairs. It is the perfect self-fulfilling prophecy and a boon to the fundraisers of charitable institutions all over the world. Haiti has become the holy grail of fundraising for fashionable charitable causes in the so-called third world. Yet Haiti has shown that you can throw as many fundraisers with dog food, marathons and bake sales as possible and nothing will change if the root causes of poverty remain untouched. Just ask Wyclef Jean and his Yele Haiti Foundation what happened to all the US government funding they received and whether it has stemmed the onslaught of poverty in Haiti. The latter got millions from the United States Agency for International Development (USAID) to create jobs for Haitians sweeping streets and performing menial jobs throughout the capital. It was the perfect US government-financed charity despite the cover of Wyclef’s high profile Hollywood friends who kicked in a little here and there to make it look good. And yet those pesky poor in Cite Soleil are still eating mud cookies. Has anyone, especially Wyclef, really bothered to ask why? I wonder when was the last time Wyclef or someone like George Clooney ate a mud cookie to keep their belly from grumbling? 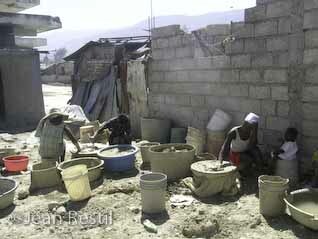 The truth is that misery and poverty outpace official aid and charitable giving in Haiti. The non-governmental agencies invited to help by the UN continue to toil despite statistics that show they receive 45% of foreign aid to Haiti and 15% of that returns to their respective donor countries. To top it off add the ‘hazard pay’ and expense accounts that make the average salary of the head of an NGO in Haiti $60,000 per year compared to the average citizen who earns less than $250 annually. Nothing like setting the right example for people forced to eat dirt as you drive to your office in an air-conditioned SUV. I know of a small progressive NGO in Haiti that promises to recycle human waste from the poor to use as agricultural fertilizer. What a great idea except that if Haitians aren’t eating anything more than dirt there can’t be much value to the end product. I don’t want to pick on them but the project serves as a metaphor for how the ‘international community’ is more concerned with what exits Haitian extremities than what enters their bodies for sustenance. The truth is that while the poor suffer through the current nation building exercise by the UN that forces them to resort to eating dirt, Haiti’s rich are getting richer. Ask the wealthy families like Bigio, Mev, Brandt and the rest of Haiti’s wealthy elite whether they have enough to eat. They were already fantastically wealthy by Haitian standards and have grown more so since Aristide’s ouster in 2004. All of this has been imposed by the UN who have served as a proxy for the Bush administration’s concept of working with the private sector as the only avenue for helping the poor in Haiti. UN development experts ask us to believe that creating more business opportunities for Haiti’s wealthiest families will result in a demonstrable windfall for the poor. It’s the new neo-liberal agenda that incorporates the old Reaganomics trickle-down theory being instituted by the UN in Haiti. 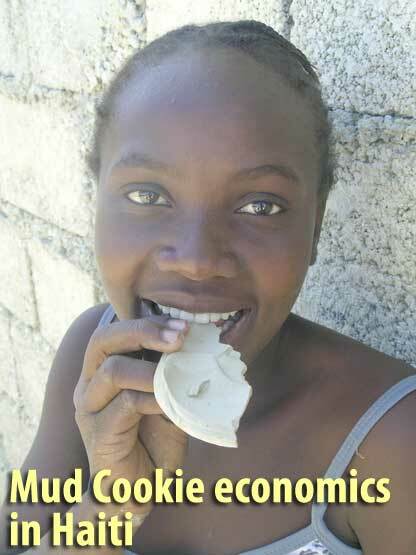 A new name for it might be appropriate in the Haitian context, Mud Cookie economics. It’s becoming more than obvious by now that this approach isn’t working and what Haiti really needs is a level economic playing field to challenge the disparity between the haves and have-nots. The aforementioned wealthy families have proven over time to be unreliable providers and partners to Haiti’s poor majority. They are in fact predatory monopolists controlling markets and not free market capitalists competing on a level playing field in Haiti. No amount of investment by the international community or charity will alter that fact. 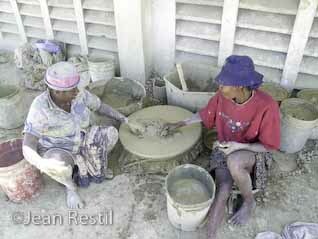 This is the real message behind the recipe for mud cookies the poor are forced to eat in Cite Soleil today. In today’s Haiti it’s all about supporting business and the private sector while abandoning the rest of the population to be cared for by charities. 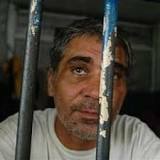 That’s what Bush, the UN and the cadres of economic experts have left Haitians with after all is said and done. It clearly favors those who already have the capital to invest while increasing dependency on foreign largess for the rest. It seems clear enough that until the monopolist hold by a few families on the Haitian economy is addressed, we can expect to hear more about mud cookies in the future. I wouldn’t hold my breath though; the last president to even dare to raise this question remains in exile. Aristide was ousted in 2004 and his movement that gave the poor a sense of controlling their own destiny was brutally savaged. Poverty without real sovereignty and the ability of Haitians to change this reality seems preferable to poverty with dignity for those who continue to benefit from it.